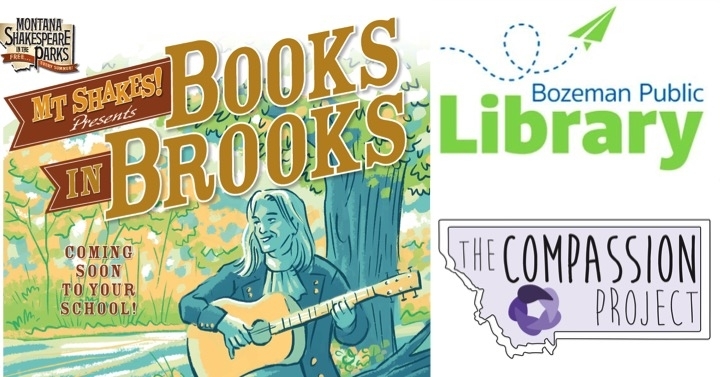 Montana Shakespeare in the Park presents of "Books in Brooks", at Bozeman Public Library! This a 35 minute original play by Douglas MacIntyre with scenes from Shakespeare's "As You Like It" written specifically for young people grades K-5. "Books in Brooks" teaches that even when you're in a new and unfamiliar place, kindness and friendship will serve you best. The play is completely free to the public and will be held in the Large Community Room at the Bozeman Public Library. Dr. Kayte Kaminski, Executive Director of The Compassion Project will also speak about the work TCP has been doing with students K-12 as they are about to launch several art installations around the city.